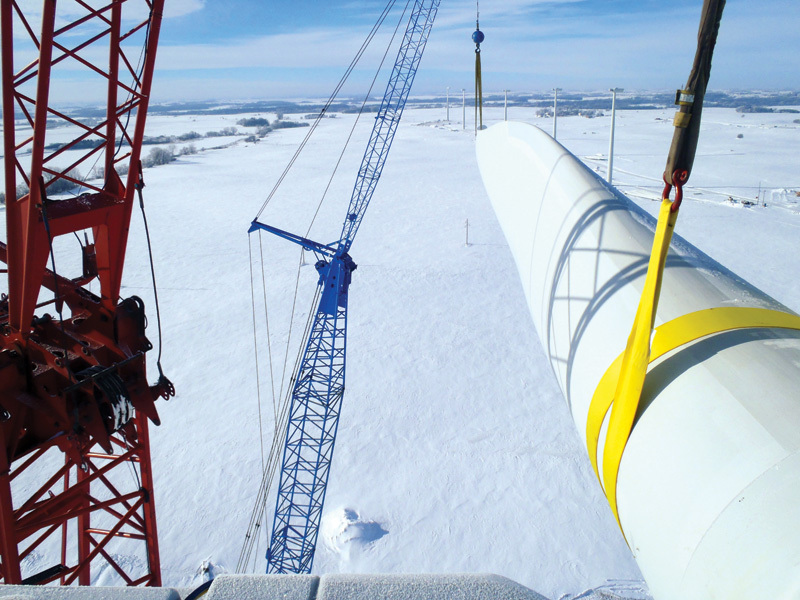 Wind turbine supplier Alstom chose to take on a multi-site wind power project in Minnesota for its North American debut, and the 39.6 MW Adams and Danielson wind projects went well, thanks to a commitment to safety and teamwork. 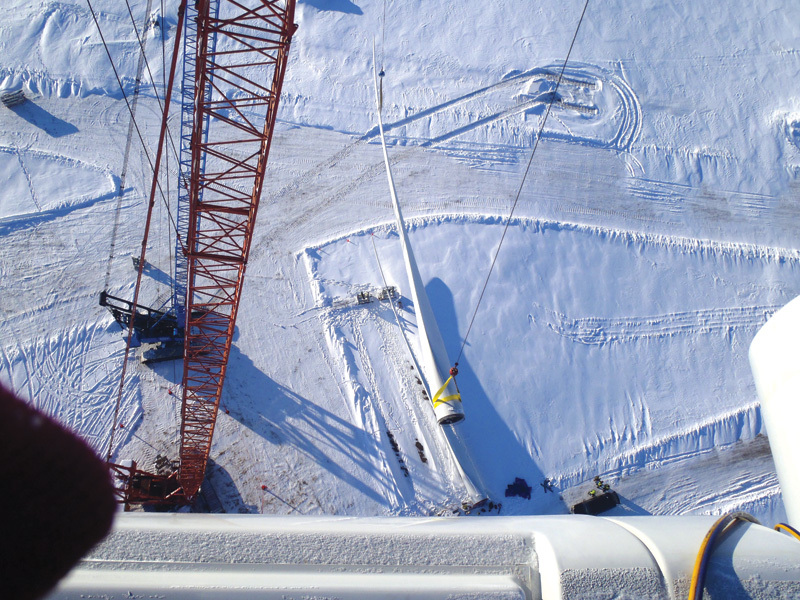 One of the big challenges with a wind power construction project is logistics management, from getting material to the site on time, to the on-site coordination of people and equipment. When you have two adjacent projects on the go, and you're trying to best manage resources in severe winter weather, the logistics challenge can get really interesting. That was the case with the Adams and Danielson wind power projects in Minnesota, which were completed earlier this year. The projects were developed by Juhl Wind Inc. and involved Alstom supplying a total of 24 of the company's ECO 86 1.65 MW wind turbines to the two wind farms. Alstom, based in France but with a strong, decades-long American presence, is a leader in supplying equipment and services for power generation, and these were the company's first wind power projects in North America. The company has installed or is installing over 2,100 wind turbines producing over 2,700 MW on over 110 wind farms in Spain, France, Portugal, Italy, the UK, Turkey, Brazil, India, and Japan. Considering this was the company's first go at North American wind power, Alstom was committed to ensuring the Minnesota wind projects went well and were delivered safely. "We were heavily involved in the Adams and Danielson projects from the day the first shovel went into the dirt right through to their commissioning," says Matt Davidson, the company's project manager. "It's really been an exciting time for the company in North America," added Davidson. Besides the successful start up of the Adams and Danielson wind projects, Alstom also had one of their 3.0 MW ECO 100 turbines installed at the National Re-newable Energy Laboratory's (NREL) National Wind Technology Center (NWTC) in Colorado. Alstom has strategic research partnerships with both NREL and the National Institute of Renewable Energy (NIRE) in Lubbock, Texas, (where they also have a 1.67 MW ECO 86 installed) that will enable the company to integrate its proven wind power technology with the North American power grid. In addition, Alstom has expanded its presence in North America with the construction of a new, 115,000 square foot wind turbine nacelle assembly facility in Amarillo, Texas. "Starting commercial operation of our first wind project in North America is an important milestone for our business," said Andy Geissbuehler, vice president and general manager of Alstom's Wind Business in North America. "The combination of this project, our strategic research partnerships with NREL and NIRE, and the ongoing construction of our wind turbine assembly facility in Amarillo give us a solid foothold in the North American wind power market." "We see these as big steps in our entry into the North American wind market," added Davidson. Along with its expertise in the European market, Alstom also brings to every project a rock solid commitment. "We're committed to safety in all of our projects—it's an area in which we hold ourselves to a very high standard," says Davidson. Case in point: the two Minnesota wind farms were constructed with zero injuries and zero Lost-Time Incidents during some very demanding winter weather. Davidson first got involved with the two projects in May 2010, during the closing of the turbine supply agreement with the two owners, Adams Wind Farm LLC and Danielson Wind Farm LLC. "It was a great effort by everyone concerned—we all worked hard to get our documents so we could start the project in the early fall." While Alstom was able to achieve some economies of scale and efficiencies doing the Adams and Danielson projects, they approached them as two separate projects. If there was one overriding theme to the projects—in addition to safety—it was the need for everyone involved to work together. Even though the Adams and Danielson project sites are relatively close together—they are only about 10 miles apart—they were quite different in topography, reports Davidson. "When you are up in one site's turbines, you can actually see the other wind farm. The Adams site is very typical Midwestern, cornfields and quite flat, and the Danielson site was a little hillier—it was actually a bit unusual to see those kind of undulations in Minnesota. "I wouldn't say that it was like night and day working the two different projects, but Danielson represented a little more of a challenge with the hills and the extra logistics required. It required more team coordination on how equipment deliveries were going to be sequenced and where things were going to be laid out." While Alstom was able to achieve some economies of scale and efficiencies doing both projects, they approached them as two separate projects. If there was one overriding theme to the projects—in addition to safety—it was the need for everyone involved to work together. "There was a lot of teamwork," says Davidson. "Our original idea of the execution of the projects was to do them sequentially. We wanted to start at the Adams site and then go to the Danielson site. But as projects tend to do, things change, and your objectives change. In our case, there were weather changes, and we had to adjust." The team came together and considered their options. "We ultimately decided that the projects should go ahead on parallel paths, and from a construction standpoint, that there should be an Adams team and a Danielson team, with each team independently running their project. Each project had their own main erection cranes and auxiliary cranes and crews—and they went at ‘er," says Davidson. With each project having their respective cranes, and a tight timeline, there was not a great deal of sharing of resources on the erection side. "On days that they could share cranes, they would. But the electrical contractor was moving people back and forth. The duration of their work was a little bit shorter than the erection work, so they would move between the projects, go where they could to get the work done, and keep things moving forward." As Davidson notes, it's a lot easier moving people from one project to another than it is moving cranes. Just how closely the projects proceeded in tandem was illustrated by the fact that they were completed within days of each other. Davidson explained that among the core values of their construction team were discipline and following the principles of effective project management. "We were pretty much continuously working the plan and revising the plan due to weather. Sometimes we would meet with the construction managers twice in a day and re-work the plan. It was just by continuously doing the right things—the things that we knew needed to get done—that we were able to execute the plan so that both Adams and Danielson were closely on track together." Constantly changing the plan might seem counter intuitive in terms of efficiency, but having this flexibility was truly key to both projects moving ahead. "It's not like we wanted to change the plans," explains Davidson. "External influences such as the weather or project difficulties or material delays due to weather required us to make changes. Various things happen on a project and force you to react, and you need to react and change, or you're going to be in a worse situation a couple of hours down the road or the next day." Even though they started each day with a Plan of the Day, some days involved having several plans of the day. Some days, Davidson would meet with the balance-of-plant (BOP) contractor at the end of the day, so they could prepare changes for the following day's Plan. Tyler Juhl, from the developer Juhl Wind, was on site pretty much on a daily basis and was closely involved with any changes. A joint venture between Carstensen Contracting Inc. and Ryan Companies US Inc. was the BOP Contractor for the projects. Davidson, for his part, was philosophical about the sometimes constant changes, noting that very few wind power project construction jobs run like clockwork. "Each project has its own challenges," he says. He emphasized the importance of everyone involved with the job, on site and off site. Alstom's transportation department did a "phenomenal job" getting equipment there on time, safely and in good condition. And everyone, he added, was committed to meeting the March 2011 deadline for commercial operation of the projects. "There was a common vision of zero lost-time accidents and meeting the deadline. We all signed up to meet the deadline, and when you get that energy, it drives a fire within everybody that we can do this, even though there may be 15 feet of snow out there." Getting material to the site was relatively straightforward. Meeker County, the location for the two wind project sites, is about 60 miles west of Minneapolis/St. Paul, so major road transportation corridors were close by. "There was good access for all of the trucks coming in with the blades, towers, and the nacelles," says Davidson. "The nacelles came in through the Port of Duluth, so it was only a day's drive down to the project sites. Alstom was continuously working the project plan and revising the plan due to weather. Having this flexibility was truly key to keeping the Adams and Danielson projects closely on track. "The county roads, with a little bit of work and help from the BOP Contractor, were perfect. They widened the corners a bit." He added that they received great cooperation from the county, in terms of the road work that was done and the occasional road closures that were required. Alstom and the contractor also worked closely with the landowners, who are the owners of the wind power projects. "Sometimes we met with landowners on a daily basis—they were very engaged in the project and an amazing group of people." The landowners were supportive, in ways big and small—sometimes even involving cookies. "They would come by and lift your spirits," says Davidson. "There were a lot of long days on those projects, and after one of those long days, you would come back to the trailer and see some home-made cookies from one of the landowners. They knew it was -15 out there, and that the guys were working hard—they were very gracious and nice folks." In addition to this being Alstom's first wind project in North America, it also marked the North American debut of the company's ECO 86 1.65 MW wind turbines. The company also offers its ECO 100/110 wind turbine platform to accommodate the differing wind regimes across North America. 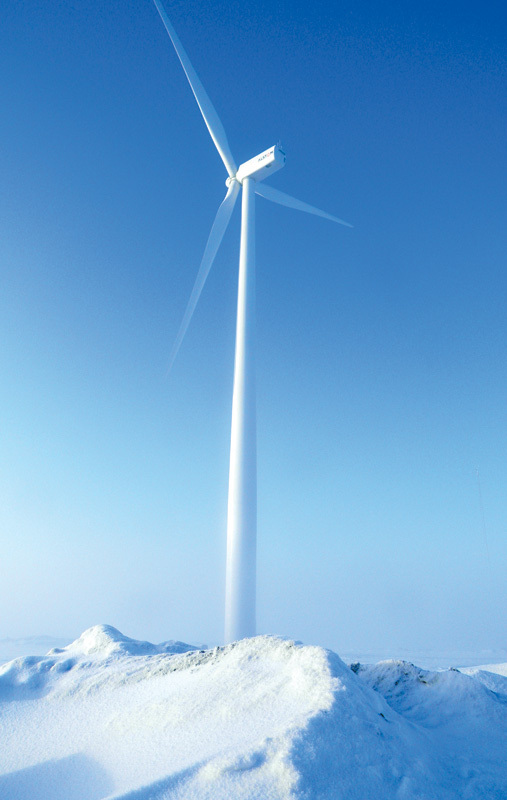 All of Alstom's wind power offerings feature the company's ALSTOM PURE TORQUE design, a unique rotor support concept that protects drive train components from deflection loads thereby delivering higher reliability, higher operational availability, and lower maintenance costs. "Basically, with the ALSTOM PURE TORQUE design, the forces of the weight of the blade and the hub are no longer transferred along the lower speed and high speed shafts," explains Davidson. "The vast majority of that weight is transferred from the hub and blade down to the ALSTOM PURE TORQUE system, down to the tower, eliminating the pendulum effect, and transferring the weight to an area that can better sustain the load over longer periods of time." The ECO 86 turbines feature a three-section, 80 meter tower, which is new to the U.S. market, Davidson notes. "It features a tower embed, which is more common in the European wind power market. A flange is embedded into the foundation, so when the contractor comes to stack the sections, they have a bolted connection, rather than an anchor bolt connection." Another feature of the ECO 86 is that it has blade extenders. These extenders house the pitch system, so it's not a straight blade to hub connection; it's blade to extender, then extender to hub connection. It required some extra planning and coordination on the part of the erection contractor to make sure that everyone understood what was going to happen when two pieces need to be lifted versus the usual one piece. Even though the Adams and Danielson wind projects went well, Davidson said there are always things to learn from any wind project—what to do next time, and what not to do. "I think any good wind turbine manufacturer or contractor has to continually strive to progress to be competitive in this market. We learned some lessons from this project, because this is the first time we've executed this turbine in the U.S. market." There is now a better understanding of what is done in the U.S. versus Europe, and what might be applied. "It's been a great process," says Davidson. "We'll be meeting with the Alstom wind team in Barcelona to share some of the lessons learned and make changes to make us a better team." Davidson added that the larger Alstom team was able to bring a wealth of experience to North America. "The knowledge from the Alstom wind team in Barcelona was invaluable. We had a small team come over to help us out with commissioning the Minnesota projects. They were out there with us in the middle of the worst winter weather they will probably ever see in their lifetimes. "The support we had from them, and from Alstom's entire U.S. team, was amazing. It gets back to teamwork—there were a lot of people who made these projects happen."